Your home’s chimney might look like it’s in good condition at first glance, but if you don’t have it cleaned and inspected every year there could be serious issues hiding just beneath the surface. If left unchecked, these issues could even cause a house fire. Today we’ll look at a few of the most compelling reasons to invest in an annual chimney inspection. Cracks can develop in the flue. The flue is arguably the most important part of your entire chimney. This pipe is responsible for carrying heat, smoke and fumes out of your home when you light a fire in a wood stove or fireplace. Over time, however, an old flue can start to degrade when exposed to excessive heat, moisture and other environmental factors. A chimney inspection will make sure your flue is in good condition, so you won’t have to worry about carbon monoxide gas becoming trapped in your home. Creosote can build up on the inside of the chimney. Each time that you start a fire in your fireplace, a little bit of creosote will build up inside the chimney. Creosote is a potentially dangerous oily byproduct that’s created when wood is burned. A little bit of creosote inside your chimney is nothing to worry about, but too much creosote buildup can constitute a serious fire hazard. 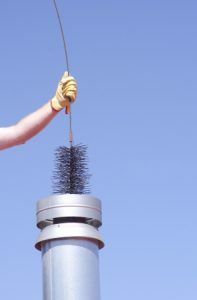 A chimney inspection offers an ideal opportunity to remove excess creosote before it becomes a hazard. Animals can find their way into your chimney and build nests. Most chimneys have caps that are designed to keep animals and debris out, but some animals like squirrels and raccoons may still be able to find a way into your chimney if you’re not careful. Once inside, they’ll often build nests that obstruct the chimney and prevent smoke and heat from escaping your home. If you hear any evidence of animal activity in your chimney, be sure to call a qualified chimney cleaning service as soon as possible. Need a hand tackling some DIY projects around your home this winter? At Lawrence Tool Rental, we have everything you need to get the job done right. Just give us a call or contact us online today to learn more!